Child Helpline works around the globe to help strengthen child protection systems. The organization provides child helplines in 141 countries to connect children to services. It works with the telecommunications sector to ensure free-of-costs access to helplines everywhere, and it collects, analyzes and disseminates data to key decision-makers to advocate for better protection of children. The MDG Achievement Fund, established in December 2006 with a generous contribution from the Spanish Government to the United Nations system, aims to accelerate progress on the Millennium Development Goals (MDGs) worldwide by supporting joint programmes with national governments, local authorities and citizen organizations in their efforts to tackle poverty and inequality. See the report on social and institutional tolerance of gender-based violence. Download the household and public institutions survey instruments. See a Power Point presentation on the preliminary results. Download the household and women survey instruments. Other programmes that included substantial violence against women work within broader gender equality programmes, included Viet Nam and Timor-Leste. The Gender-based Violence Information Management System (GBVIMS) is an inter-agency initiative developed in 2007 in response to the lack of an effective and safe system for collection, storage, analysis and sharing of GBV-related data in humanitarian settings. Governed by a Steering Committee made up of representatives from UNHCR, UNFPA, IRC, UNICEF, and WHO, the GBVIMS has created a standardized data collection and analysis mechanism which has been implemented in 13 countries and continues to be rolled out globally. The website features materials and guidance for implementing the system, including a GBVIMS Toolkit; a user guide and workbook (in Arabic, English, French and Spanish) among other resources. Register as a member of the GBVIMS to access the technical guidance and see the factsheet to learn more about the system. The project, launched in 2007 through 2010, aims to enhance the body of knowledge on how policies can encourage men and boys to participate in promoting gender equality and ending violence against women. The project will engage policymakers to analyze public policies for gender equality markers, publish a policy analysis toolkit for countries seeking to engage men and boys more adequately in gender equality policies, and develop and apply the International Men and Gender Equality Survey (IMAGES), a standardized population-based questionnaire (one administered with women and another administered with men) to measure and monitor behaviours and attitudes regarding gender equality and violence against women. For more information, see the website in English. The project, funded by the United Nations Trust Fund to End Violence against Women, is implementing and evaluating a two-part intervention to address the social contexts of violence, encouraging men to question rigid norms of masculinity and launching public education campaigns portraying men in nonviolent ways. The project is being carried out in Brazil, Chile, India and Rwanda. Contact ICRW to learn more about the initiative and evaluation. The 16 Days of Activism Against Gender Violence is an international campaign originating from the first Women's Global Leadership Institute sponsored by the Center for Women's Global Leadership in 1991. The Campaign runs from November 25, International Day Against Violence Against Women and December 10, International Human Rights Day. Over 2,000 organizations in approximately 156 countries have participated in the 16 Days Campaign since its inception. UN Action Against Sexual Violence in Conflict (UN Action) unites the work of 12 United Nations entities with the goal of ending sexual violence in conflict. It is a concerted effort by the UN system to improve coordination and accountability, amplify programming and advocacy, and support national efforts to prevent sexual violence and respond effectively to the needs of survivors. Together for Girls is a global public-private partnership dedicated to eliminating sexual violence against children with a particular focus on girls. Launched at the Clinton Global Initiative, the partnership brings together five UN agencies including UNICEF, WHO, UN Women, UNAIDS, and UNFPA, the private sector through BD (Becton, Dickinson and Company), Nduna Foundation, Grupo ABC, CDC Foundation, and the U.S. Government through the U.S. President’s Emergency Plan for AIDS Relief, the U.S. Department of State, and the Centers for Disease Control and Prevention Violence Prevention Division. National surveys and data to document the magnitude and impact of sexual violence, particularly focused on girls, to inform government leaders, civil society and donors. Surveys have been completed in Swaziland, Tanzania, Kenya, Zimbabwe, Haiti and Cambodia and are in process in Malawi, Indonesia, Lao PDR, Nigeria and Zambia. Surveys are in the planning stage in Botswana, Uganda and Mozambique with a number of other countries also expressing interest. Evidence-based coordinated program actions in countries to address issues identified through the surveys, including legal and policy reform, prevention of sexual violence and improved services for children who have experienced sexual violence. In Tanzania the government has launched a national action plan to address the problem across sectors, and in Swaziland resultant reforms included improving services for children who experience violence and the recent passage the Child Welfare Bill and the Domestic Violence and Sexual Offenses Bill. Global advocacy and public awareness efforts to draw attention to the problem and promote evidence-based solutions. See a power point on the Initiative. The joint programme on female genital mutilation/cutting was launched in 2007 and is being implemented in 12 countries. The programme works on multiple levels in each of the countries, employing strategies, such as strengthening legislaiton for abandonment of the practice; knowledge dissemination on the socio-cultural dynamics of the phenomenon; collarboration with global partners within a shared framework; evidence-based data for programming and policies; media campaigns; and integrating FGM into reproductive health strategies. Visit UNFPA's website to read more about the joint programme. The Inter-Agency Network on Women and Gender Equality (IANWGE) established the United Nations Task Force on Violence against Women in 2007, co-chaired by UNFPA and UN Women, to follow-up on the General Assembly Resolution (A/RES/61/143) which called upon Member States and the United Nations system to intensify their efforts to eliminate violence against women. The Inter-Agency Task Force concluded its work in 2010 with violence against women remaining a standing agenda item at the IANWGE meetings. Partners for Prevention is a UNDP, UNFPA, UN Women and UNV regional programme launched in 2008 and continuing through 2011, focused on primary prevention among boys and men through partnerships with policy makers, UN staff and civil society partners dedicated to women’s empowerment and ending violence against women and girls. Since 2008, Partners for Prevention has supported prevention work in over 15 countries across the region with increasingly sophisticated technical knowledge and resources to help local partners implement evidence-based programming and to enhance policy frameworks for the prevention of gender-based violence (GBV). The programme aims to: enhance the knowledge and skills of local partners to engage in successful communication for behavioural and social change at the community level and through the use of modern technologies to reach youth; develop the capacities and networking opportunities of partner through a regional web-based resource portal and community of practice to share research, programming and training tools, successes, programmatic insights and experiences across countries; and consolidate and commission research to engage in evidence-based policy dialogue. 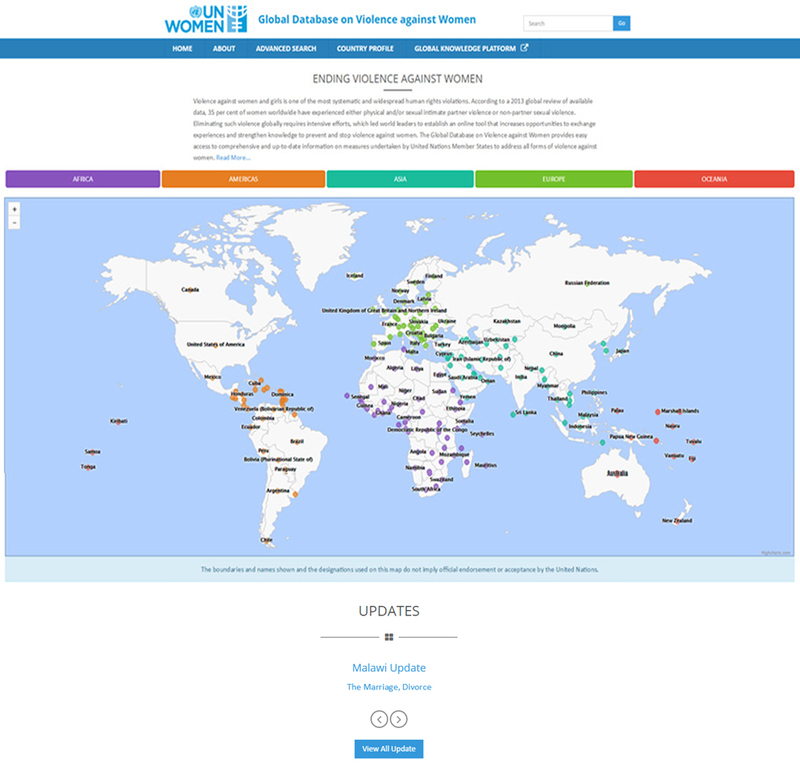 The Global Database on Violence against Women is an online resource, designed to provide comprehensive and up-to-date information on measures taken by Governments to address violence against women, in the areas of laws and policies, prevention, services, and statistical data. It also serves as an important tool to monitor the implementation of SDGs and its target areas on violence against women. Access the data base here. The Inventory of United Nations Activities to End Violence against Women is an online resource, designed to provide information on initiatives taken by the United Nations system to address violence against women. This campaign launched in 2008 through 2015 aims to prevent and eliminate violence against women and girls in all parts of the world. UNiTE brings together a host of UN agencies and offices to galvanize action across the UN system to prevent and punish violence against women at national and local levels. Part of the campaign is the Secretary-General’s Network of Male Leaders, who are working in their spheres of influence to undertake specific actions to end violence against women, from raising public awareness, to advocating for adequate laws, to meeting with young men and boys, to holding governments accountable. Total and age specific rate of women subject to physical violence in the last 12 months by severity of violence, relationship to perpetrator(s) and frequency. Total and age specific rate of women subject to physical violence during lifetime by severity of violence, relationship to perpetrator(s) and frequency. Total and age specific rate of women subject to sexual violence in the last 12 months by severity of violence, relationship to perpetrator(s) and frequency. Total and age specific rate of women subject to sexual violence during lifetime by severity of violence, relationship to perpetrator(s) and frequency. Total and age specific rate of women subject to physical or sexual violence by current or former intimate partner in the last 12 months by severity of violence and frequency. Total and age specific rate of women subject to physical or sexual violence by current or former intimate partner during lifetime by severity of violence and frequency. The United Nations Trust Fund in Support of Actions to Eliminate Violence against Women (UN Trust Fund) was established by General Assembly resolution 50/166 in 1996 and is managed by United Nations Women (UN Women) on behalf of the UN system. The UN Trust Fund is the only multilateral grant-making mechanism that supports local, national and regional efforts to end violence against women and girls. Download the Regional Fact Sheets:Africa, Arab States, Asia Pacific,Europe and Central Asia and Latin America. See the Mapping of Grantees' Outcomes (2006-2011). Available in English. This programme is being implemented from 2010 through 2016 as a collaboration UN Women, UN Habitat, local government, women’s networks, civil society partners, and other UN Agencies and is focused on the prevention of sexual harassment and sexual violence against women and girls in cities, particularly in urban spaces. This initiative prioritizes the advancement of women’s rights to create and live in safe cities and communities. Within this approach, special emphasis is given to violence prevention, government accountability, community mobilization and participation, women’s empowerment, and the improvement of neighbourhoods and the urban environment in general. The objective of the Safe Cities global programme is to deliver, through rigorous impact evaluation, the first proven approach on how to prevent and reduce violence against women and girls in public spaces, which would provide models that can be adapted and scaled up in many city contexts. The Global initiative was officially launched in New Delhi at the Third International Conference on Women’s Safety in November 2010 with an announcement of the following 5 cities comprising the evaluation: Cairo, Kigali, New Delhi, Quito and Port Moresby. See the Impact Evaluation Strategy and accompanying Glossary of Terms and Definitions. Note that the Impact Evaluation Strategy and the Glossary of Terms will be updated regularly as living documents that evolve with the programme. See guidance for Mapping Mobile Phone Use. See Safe Cities for Women & Girls in Action: Implementation Essentials & Key Takeaways. See the guidance for Programme Design and download the Project Design Templates one and two. This campaign is the largest effort in the world of men working to end violence against women. In 1991, a group of men in Canada started the campaign to urge men to speak out about violence against women. Wearing a white ribbon is a symbol of men's opposition to violence against women. Still growing, campaigns in over fifty-five countries are led by both men and women, though the focus remains on educating men and boys.